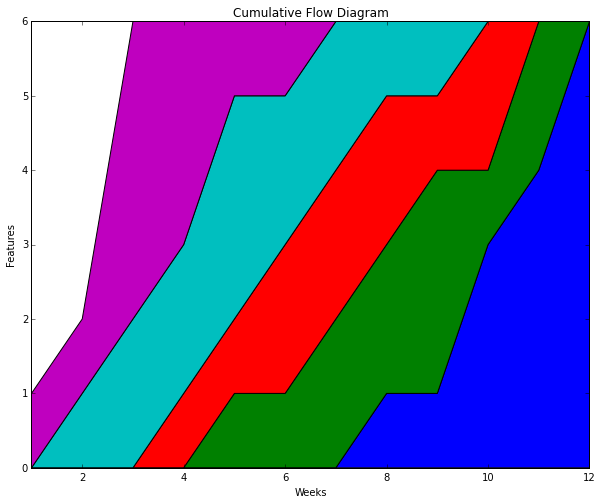 Cumulative Flow Diagram is a graphical tool used extensively in Lean and Agile projects. It is used to track project progress, visualize work in progress (WIP) and obtain understanding of issues with the project including bottlenecks & scope changes. Burn Up and Burn Down charts are much more commonly used by Agile teams than Cumulative Flow Diagrams (CFD) because they can be easily plotted on a white board using a marker pen. In the case of CFDs, it is not easy to plot it manually on a white board and so many teams therefore, have to procure software, even when the team is co-located just for the sake of generating plots. There is a way to plot CFDs using excel described here, but to automate it we need to script it. This article describes a very simple way to generate CFDs using a python script. The input to this script is hard-coded in the form of arrays for each status, but these can be easily replaced by variables input from a web form. The Kanban flow for this specific case has Requirements, Development, Testing, Verification and Done indicated by the arrays features_req, features_dev, features_tst, features_vfy and features_dne which contain the values from Week 1 (W1) to Week 12 (W12). The arrays are as below which forms a matrix. I will describe in detail the data (above) giving examples of the Kanban board for that week. The status of the board for a week should be read in vertical for that week. e.g. For week 1, there is just one feature request as indicated by the values in the column for W1 (Week 1) -> 1,0,0,0,0. In the third week (Week 3), four feature requests have come into the first column (Requirements), the one request which had come in the last week is moved to Development so that you now have a total of two features in development. So the column W3 has the values -> 4,2,0,0,0. The last column in the matrix has the values for Week 12 (W12), which is 0,0,0,0,6 and the corresponding Kanban board shows all the items (6) in the Done column. This basically means that there is one-to-one correspondence between the column for that week and the Kanban board columns. It is straight forward to construct this matrix for your specific use case even to have a similar web form constructed to feed in the data representing the Kanban board. The script uses python with matplotlib and numpy. The plot was generated using iPython in Spyder2 IDE. The script is as below. The article investigates the relationship between attrition and leadership behavior. As a Manager, your people are the source of your greatest joys and also the source of your greatest sorrows. When they leave, all the investment that you made on them goes out of the door. But the eternal truth in people management is “People don’t leave companies, they leave their bosses”. The work environment and your leadership behavior that creates it, plays a profound role in your relationship with your employee and therefore, employee retention. Please read on to find out about few of the extremely damaging leadership behaviors which cause employees to leave. There are managers among us that believe that the best way to get results is by using fear and intimidation. There are many forms – public humiliation, sarcasm and the like. These managers do not trust their employees to do good work and this, for them, becomes a way of guaranteeing that the work will be done with the level of quality that they expect. On the fear scale, fear of job loss creates the maximum fear – this goes by many names resource actions, work force reduction/re-balancing etc and the threats thereof. You may have noticed, you decide when some of them leave; they decide when more of them leave. The equation is simple – fear creates resentment. Mostly, this resentment is private and as your behavior impacts more people the resentment becomes public. Resentment makes people want to get back at you – one of the most common ways is to just leave you. Managers who rule by fear fail to understand the fundamental nature of knowledge work – Fear arrests innovation, employees want to play safe and innovation by definition requires a certain amount of risk taking. Work stays as hard as it has always been, efficiency does not improve, company doesn’t save money and in fact loses money due to the rapidly departing employees. As an organization increases in size, they want to put in processes for efficiency. Very soon, you have an environment where there are processes for everything and everyone. These first becomes rules of thumb and then very soon becomes the law (called the policy). In may big companies, you can see company veterans going around quoting these policies whenever an appropriate situation props up – if any examples of this comes to mind, I can almost guarantee you, your organization has straight jacketed itself and you will be, almost 100% be facing a serious attrition issue. In these companies, when an employee approaches you (the manager) for a solution to his/her problem and when you show them the rule book, preferring not to stand up against the defunct processes/procedures, you are setting the stage for the departure of the employee from the organization. If processes/procedures do not permit you to have satisfied employees, then they should be scrapped without compunction – this is not optional but an obligation for you as a manager to your employee and to the organization. “Knowledge is Power” absolutely! But, in the knowledge worker industry, if knowledge is held back for you to feel powerful, execution and decision-making suffers. Bad decisions get made, effort wasted to deliver the wrong work items and your employees will resent you for not sharing when them information which could have helped them make the right decisions. Your employees have a right to know what affects their work, career and life. This is critical information for them and if you hold this back or worse, they hear it from someone else, they are not going to trust you. And, without trust, don’t expect them to stick around. Remember, transparency & trust are the cornerstones of good management. Lets face it, you know good people want to do good work and you have created a Job Description document which attracts the best in the market but which is a spruced up version of the real job. Now the employee has joined expecting to find what was mentioned in the job description and then faces the reality of the current job not being anywhere near what was advertised. This however, is a recipe for disaster. You will hold the employee, only till he/she can find another job. In the knowledge worker industry, absolutely no one wants to work below his skill level or capability. Also, in the era of social networks, the image of the organization will take a beating, you will struggle to find talent in the future. People are more connected today than ever before and they are more connected than you think. The solution is, of course, to adopt a policy of complete honesty. Describe what the job is about in sufficient detail so that the person applying for the position has a very good understanding about the position. Conduct the interview to evaluate the skills which are necessary to do the job – do not hire the “best person”, hire the “right person” for the job. Also, during the interview, ensure that the candidate understands the job requirement, the work timing and anything else which he/she may want to know. When your people work hard for you and they see you pushing in your relatives/friends into important positions in your organization, they see you rewarding someone in your team for reasons other than professional, they feel crushed. You may have established a coterie system and culture of favoritism to make you feel secure, but these hardly work in the long-term. When your employees see what is happening, they take the shortest way out because working for such an organization is just a waste of time. For you, the manager, everyone in the team should be equal irrespective of region, religion, color, gender or anything else. When you reward a professional achievement, it should be because of that achievement and nothing else. To be unbiased is such an important criteria for a manager that even the remotest perception of bias quickly kills productivity and damages the team irreparably. Ask yourself, How good am I in creating & finding opportunities for my team members ? How passionate am I to push them to take higher responsibilities, to help them grow, to encourage them to learn ? If you struggle to find answers to the above questions, then you will, for sure have an attrition problem. Most top employers provide development support ranging from career planning, formal mentoring, tuition assistance with study leave that help employees prepare for more advanced positions. They have clear career paths, goals and tons of encouragement for employees to learn. Employees want to see a future for them. As they work with you, they need mentoring, guidance and developmental support (training, opportunities, certifications etc.) for career advancement. If you are not going to provide then with these opportunities or support they are going to find someone who can. Some managers adopt a divisive strategy and pit one employee against the other, one department against the other. They do it with the expectation that competition encourages performance. Healthy competition is good, but this approach creates a very negative atmosphere with huge amounts of stress. Most people are not comfortable facing stressful situations day after day, they will leave you and the company if stress is making them feel unwell. There is a quantifiable cost associated with bad leadership behavior. The simple metric of the number of people citing “relationship with manager” as the reason for leaving can serve as a starting point if your organization wants to quantify this cost. This is usually much higher than the budgets for “Learning and Development” and “Employee Engagement” budgets put together. Organizations often pump up their employee engagement funds and development budgets to prevent attrition and leadership behavior is an often ignored and under-investigated area but which has huge impact on employee retention. So if you want to know Why are my employees leaving me ? Reflect on your own behavior and others in your management chain, make sure it is not what is driving your people away. Author rajiv.gangadharanPosted on August 7, 2015 Categories Leadership, ManagementTags attrition, Leadership behavior, people managementLeave a comment on Leadership Behavior and Employee Attrition – Why are your employees leaving you ? In one of the organizations that I worked with, a newly minted Executive wanted to set things right and improve the productivity of his organization. The question posed to his management team was “How can we increase the productivity of resources (employees) ?” After some discussion, it was decided to measure “Employee Utilization“. A couple of voices of reason in the room was rapidly silenced. An experienced Project Manager and couple of senior technical staff was quickly commissioned to develop software to make this happen. A few months later, we had the necessary software developed, tested and ready to deploy. After some fanfare, it was rolled out across the entire department to capture the utilization of resources. Managers were told candidly that they have to ensure that their teams fall in line and input the number of hours worked or face the consequences. The outcome, however, was very different from expectations. Every one in the organization reported a utilization of at least 10 hours each day and people who did report a utilization of less than 10 hours were penalized by being assigned to more number of projects to improve their utilization. Very soon, in a matter of weeks, the reports showed everyone in the department to be 100% utilized and since everyone was 100% utilized there was no further scope of improvement. The tool failed in what it intended to achieve and was rapidly decommissioned (without even a whimper). In the above scenario, the crucial aspects of knowledge work was ignored – thought and collaboration. Let us delve a little into the process of thinking which is so important for generating the results of knowledge work. We think in two modes – Focused Thinking and Diffused Thinking. These two modes are mutually exclusive, we cannot be in both focused and diffused modes at the same and also, we cannot be one mode for long. Focused Thinking is when we think in a very focused manner on the task at hand. A good example is a programmer recollecting the syntax and semantics of a language while writing code. What does not happen in Focused thinking is the generation of new thoughts. New Idea generation and innovation does not happen in Focused Thinking. Diffused Thinking on the other hand, generates new thoughts and therefore new and innovative ideas. This is the reason why sometimes a solution that evades us even when we think very hard about it, suddenly occurs to us when we are sleeping, relaxing or otherwise doing something else not related to that problem. Innovators like Edison developed ways on switching between these modes at will. It is a basic requirement, just like breathing is required to sustain life, that the brain switch between the focused mode and diffused mode. If this switches do not happen, burn-outs are imminent. This basically means that, without the freedom and environment to think and express thoughts, productivity will be curtailed. Knowledge workers achieve outcomes by collaboration. Especially in the IT industry, there are a lot of published material on the value of collaboration in the development of better software and how processes to ensure tighter collaboration results in better software. It follows that, without an environment of collaboration, productivity, innovation and quality of the outcome will be adversely affected. Measurement of productivity on the basis of utilization (“seat time” or “availability”) results in the following issues and the resulting undesirable outcomes. There is pressure to produce with little thought -This basically means that, most of the work is done with the brain is stuck in the focused mode. Since new thoughts do not happen in focused mode, better ways of obtaining the same outcome does not happen – Innovation suffers. This also affects quality. In disciplines like software engineering, this gives rise to extra ordinary amounts of technical debt, non-optimal solution development and this has a cascading effect on software stability and customer satisfaction. Compliance to an availability criteria is a prime requirement, everything else is subservient to this – This gives some returns initially, but gradually, employees suffer burn-outs. This gives rise to sick leaves and time-offs (including planned time-offs). Over time, the actual drive to deliver value decreases. Pressure to perform at 100% utilization kills collaboration – In cultures where utilization is measured, collaborative activities are considered as productivity loses. However, when collaboration decreases a lot of desirable features otherwise seen in cohesive teams like increased morale, respect, self-esteem, interpersonal awareness, group pride, loyalty, goal orientation all of which results in a much higher level of performance goes down the drain. So what does employee utilization has to do with productivity (delivering customer value) ? Absolutely Nothing!! So what shall we do to make things better ? Ask the right question – This is of prime importance. What we do not ask, we do not attempt to measure; What we do not measure, we do not understand; What we do not understand, we cannot improve. From a customer value perspective, the questions may be What is the outcome that we desire ? What does the customer want ? How will the customer benefit ? How stable is the software ? How happy the customers are using our software ? The measurements should obviously follow. The employees, since the outcome is being measured, will focus on delivering the desired outcome and since this is aligned with customer value, results in a better customer alignment, more business and better profits. So ask the right question ! Author rajiv.gangadharanPosted on July 22, 2015 Categories Agile, Agile Metrics, Lean, Project ManagementTags Culture, Leadership, Management3 Comments on Productivity & the fallacy of cent percent utilization – Ask the right question ! For reciprocity to succeed in an organization, servant leadership is a must. Any other form of leadership may not be as successful. The concept is very simple and exists pretty much from the beginning of human civilization – If you are nice to your co-workers, neighbors and others in your society, they are nice to you. If you help – they help you back. It is this, that has enabled us, humans, to survive through the ice age and all other ages since then. This basically means that, if a company is nice to its workers, then the workers are nice to the customers/clients and the customers/clients will reward the company with more work, which will increase the profits of the company. However, there is a catch – Reciprocity is a social phenomenon – one that exists between two people. An abstract entity, like a company, can never create the environment required for this social phenomenon to exist. Since this is a social phenomenon and for this social phenomenon to be leveraged, the company has to be, in some way, personified. Moreover, this is also a local phenomenon something that happens at the team level. Other factors that are in play are team size (the larger the team – the less effective the feelings of mutual obligations are) and how engaged the team members are. So it is apparent that the role of a leader and the existing social environment in the team plays a huge role for this phenomenon to exist in some significant way. Authoritarian leaders, who micro-manages decision making, who solves problems for their followers are particularly bad in creating this team environment. These leaders seem to think of their teams like children who needs to be controlled and usually there is a heavy governance in place for these teams using spreadsheets and presentations where they can measure the behavior of their teams at a very low level of granularity. I emphasize the word behavior as against performance – because performance is measured on the basis of outcome – Behavior is measured based on what was done, how it was done and when it was done by whom. The benefit equation in these cases, are heavily tilted towards the leaders. There is typically no thought for the benefits for the follower (employee) in executing the instructions of the leader. In many cases, there may not be any benefit for the follower or the organization and the only person to benefit may be the leader himself. Since the follower does not believe in the value of the task, execution may not be thorough or high quality. The leader, over time, develops a low opinion of his team and this is further reflected in his behavior and the subsequent benefits for his team. This further drives the happiness, motivation and quality of work on a downward spiral in the organization. Alignment of the Individuals (Team Members) goals to that of the organization – Team members do what they are passionate about doing, what they see a long term value in doing and the leader helps to align these to the organizational objectives. Coaching and Mentoring – These are important enabling behaviors which help the follower/team member move up in his career. Commitment to build a cohesive & self organized team – There cannot be self organization without cohesiveness and there cannot be cohesiveness without some self organization. The leader should facilitate the emergence of a cohesive team by facilitating the resolution of conflicts and building the over all environment avoiding everything that results in non value added (NVA) work and enterprise environmental factors that saps the energy of the team (e.g: Heavy governance, documentation heavy compliance requirements, process heavy quality checks etc.). Empower the team – Localization of decision making related to execution avoids hand-offs and wait times. This brings about huge gains in the removal of waste from the existing processes and creates a motivated and happy workforce. Nothing kills motivation more than heavy processes with huge wait times. It’s very clear, in the case of servant leaders, the benefit system is balanced, each deriving value from the other, each positively influencing and getting influenced by the other. If the organization is deriving value due to the contribution of the employee, the employee also derives value. This value, derived by the employee is in his/her ability to gain a higher level of expertise. This is an immense reward, especially in the knowledge worker industry where people take huge pride in their expertise. Reciprocity, to happen in an organization requires engagement at the team level. It requires the personification of the organization for the team member or employee in the form of a servant leader. It requires an environment where there is a balance in value that the organization as well as the employee realizes from the relationship. Reciprocity, then, goes a long way towards meeting the strategic goals and objectives of an organization.